Dr. Vincent Luan grew up in Houston, Texas. He attended Strake Jesuit College Preparatory. Upon graduating from Strake, he attended Baylor University and obtained his undergraduate in Pre Dentistry. Dr. Vincent then attended school at University of Texas Dental Branch in Houston where he received his Doctor of Dental Surgery degree. After dental school he completed a hospital residency at the West Los Angeles Veteran’s Administration, part of the UCLA Medical system. Following his hospital training he practiced dentistry in Arizona and Texas with focus on treating children. Since he enjoyed working with children he decided to specialize in Pediatric Dentistry. He completed his two year specialty training in Pediatric Dentistry at St. Barnabas Hospital, part of the Cornell system in New York. While there he served as Chief Resident in the Pediatric Dental Department. Immediately upon graduation, Dr. Vincent practiced Pediatric Dentistry in Southern California. After living on both the West Coast and East Coast he decided to move closer to his parents and sister, Dr. Alice, whom he works with. In the 7th grade I suffered a traumatic injury to my mouth which resulted in a broken front tooth. My family often struggled financially and unfortunately my parents did not have the means to pay for me to have my tooth fixed. I remember feeling self-conscious, uncomfortable and would rarely smile. Kids often teased me and called me names which greatly affected my self-esteem and confidence. After what seemed like an eternity living with my damaged smile, I was able to get my tooth fixed. Once again, I was back to the happy, confident young man my family, friends and teachers knew. Adversity is one of life’s few guarantees. It comes in all shapes and sizes and we all handle it differently. It was because of this childhood experience that I chose to pursue a career in pediatric dentistry. I strive to help children feel confident and empowered by exhibiting a bright, happy and healthy smile. Dr. Vincent is devoted to giving back and participates in the Give Kids a Smile program & has gone on missionary trips to Honduras and Guatemala to provide dentistry to children who have no access to modern dentistry. Dr. Vincent is also a member of the US Olympic Dental Committee and is the former president of the Houston Academy of Pediatric Dentistry. When not practicing dentistry in his private practice, he is teaching at the University of Texas Houston Dental Branch. Dr. Alice is certified by the American Board of Pediatric Dentistry. Dr. Alice Luan was born and raised in Houston. She received her undergraduate degree at the University of Michigan. She then made her way to the University of Texas Health Science Center in Houston where she received numerous accolades for clinical and academic excellence in route to obtaining her Doctor of Dental Surgery degree. Looking to improve herself clinically she completed a general practice residency at the Harvard School of Dental Medicine. Dr. Alice realized that her passion in the field of dentistry was in the prevention and provision of dental care for children. She pursued and received her postdoctoral certificate in pediatric dentistry at the University of Texas Health Science Center in San Antonio. Dr. Alice has participated in many school-based education and screening programs as well as volunteered at the local community clinics. Dr. Alice is a member of the American Board of Pediatric Dentistry, American Dental Association, American Academy of Pediatric Dentistry, Texas Dental Association,Texas Academy of Pediatric Dentistry, and the Houston Academy of Pediatric Dentistry. When not at work, she enjoys being outdoors, especially playing sports and spending time with her friends and family. Dr. Katy Jones is a native Texan and has resided in the Houston area for the past decade. Dr. Jones graduated from the University of Texas at Austin with honors, receiving a Bachelors Dental in Biology. She obtained her Doctorate of Dental Surgery at the University of Texas School of Dentistry in Houston, graduating with high honors and other distinctive achievements including the Dean’s Student Excellent List and election to the National Dental Honor Society. Dr. Jones has always had a love for children, and tailored her education to meet their unique needs including classes in psychology and education, and gained practical experience at child development centers, church nurseries, and “roughing it” with teenagers as a camp counselor. To ensure that the best care was given to her patients, Dr. Jones completed a two-year post-doctoral residency in Pediatric Dentistry at the University of Texas Health Science Center at San Antonio. She obtained extensive training in sedation and anesthesia, hematology and oncology, and other pediatric medical conditions and syndromes at San Antonio Children’s Hospital. Dr. Jones and her husband reside in the Fulshear area where they raise their son Michael, and their beloved Shelties. Dr. Aline Medina was born and raised in Mexico City, Mexico. While growing up she would often help her mom in her dental practice which made her passionate to become a dentist. She graduated from Universidad Intercontinental in Mexico with her dental degree. Throughout dental school, Dr. Medina’s passion for pediatric dentistry radiated throughout her commitment to education and giving back to the community. Dr. Medina decided to further her education and become a pediatric dentist. She received her certificate in pediatric dentistry from Nova Southeastern University in Florida. She focused her training on providing comprehensive care for pediatric patients including those with special healthcare needs. She is currently Board Eligible by the American Board of Pediatric Dentistry. 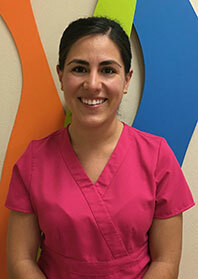 Dr. Medina has an enthusiastic attitude towards providing dental education and care to her patients and their families. Her goal is to make each visit a comfortable experience, creating a relationship where her patients enjoy going to the dentist. When not working she also enjoys spending time with her husband and their two dogs!